Africa awakens the soul and conjures up your adventurous spirit like no place on earth, leaving you forever touched by its wonders. We are Africans, and are proud to have been tailor-making journeys for travelers like yourself for over 10 years. We invite you to come and take a journey with us. Africa is diverse, and holds many incredible destinations to discover. 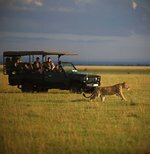 See below for some of our favorites, and chat to us about which of these destinations we can combine to create your perfect safari experience. A formidable resource in African safari planning, this team has literally travelled the length and breadth of Africa, separating the good from the bad in search of her best kept secrets. Meet the team and get to know a few of the personalities behind Safari365. A great testament to our service is that over 40% of our business is derived from repeat and referral guests who have travelled with us before. Read some of their 311 reviews here, and let us know if you would like to connect with any of them. We will gladly put you in contact.